Chris Vanocur has been a reporter in Utah for three decades and is currently the host of “On The Record” on ABC channel 4. 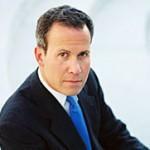 Chris has been honored with America’s most prestigious journalism awards -including the George Foster Peabody Award, the Columbia University Dupont Silver Baton and the Edward R. Murrow Award for Excellence in Reporting. Oh… and he hangs out with his dog named Scoop. I like Chris but holy crud he is shifty in his answers to everything!